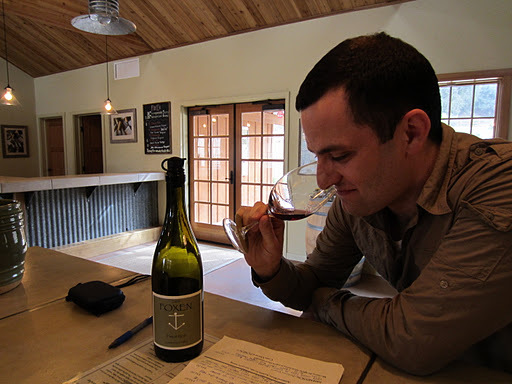 Several weeks before I left for my trip I began sending emails to wineries in California to introduce myself and explain the nature of my trip. Many responded enthusiastically, particularly from the Napa Valley, some a little reluctantly and some not at all. The former reason because they are more setup for tourism in their particular area and have staff who are employed for this reason. The other two reasons because they are smaller operations and are too busy with vintage at this time of year, and understandably so. One response I got was from Santa Barbara County Icon, Jim Clendenen from Au Bon Climat Wines, which he established way back in my birth year, 1982. Jim has established global recognition for his pinot noirs and chardonnays, and has been at the forefront of sustainable organic viticulture and careful site selection. His wines have also established a reputation for being outside the mould of Californian fruit and alcohol bombs, aiming for more elegance and food friendliness. 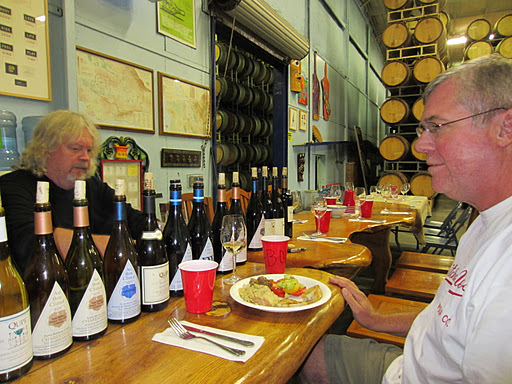 When Jim invited me to the winery to join the team for lunch, I was pretty excited and rapidly accepted. 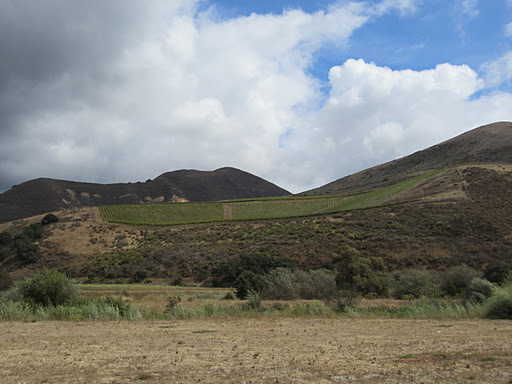 The winery itself is located at the Bien Nacido Vineyard, which is located in a deep valley in Santa Maria. 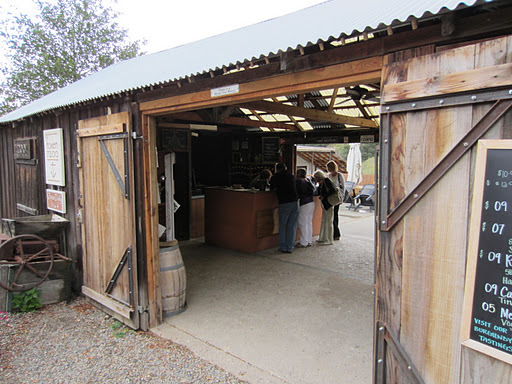 Since the establishment of the winery there are now several others that have joined ABC in the valley. The terraces on which vineyards are planted are quite special, but must be a little difficult to get to for harvest. The valley in which the vineyard is located is roughly the size of the entire Chablis region, just to put it in some perspective. My initial host was the lovely Krista who handles the marketing for the winery. 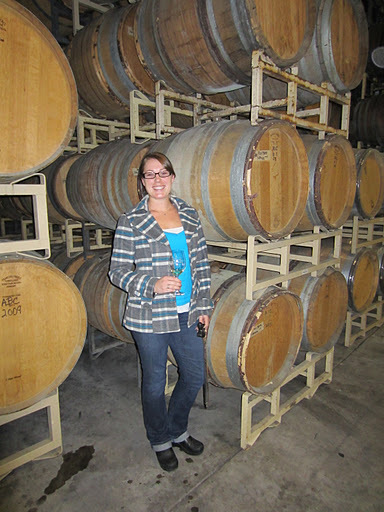 With Krista I got to try a number of 2010 wines from barrel, some of which will spend at least another year maturing. The first friulano I have tried from outside of Italy was a particular highlight, quite amazing fruit and acid structure. Before long we were invited to join the team for the fantastic lunch Jim had prepared himself from produce grown mostly in his own gardens. The food was hearty and delicious, not what you might consider classically American, very fresh and healthy. Making wines with Jim is Bob Lindqvist under the Qupe label, who sat opposite Jim next to me. A long line of bottles from both brands had been opened for our enjoyment with the food. Fruit for the wines comes from several vineyards throughout the Central Coast, with most being made into single vineyard wines. As the reputation would suggest, the wines have elegance and restraint with fantastic acid structure. Considering most of the chardonnays have 100% malolactic fermentation the creaminess and buttery characteristics are quite delicate and well-integrated. The reserve wines in most cases are a tad heavy in the oak character whilst young, but they are clearly wines designed for ageing to allow the oak to subside and integrate into the wine. Bob also produces a few wines made from Spanish varieties – albarino and tempranillo – which were very impressive and quite Spanish in style. It was a shame to have to leave such welcoming and warm hosts, particularly as Jim has such an affable and fun personality. Considering they have daily winery lunches I envy the team working for him, as it must be a great environment. 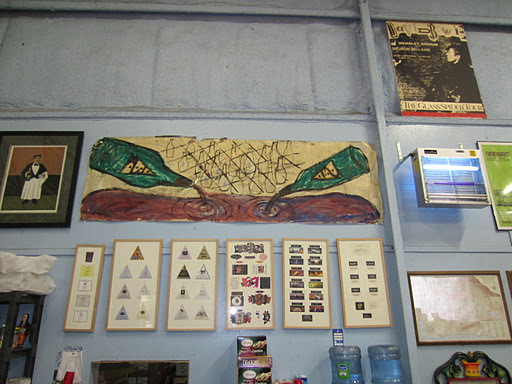 The winery is decorated by a number of Jim and Bob’s other passions; The Rolling Stones and the Los Angeles Dodgers. Heading out of the Bien Nacido Vineyard I headed over to Foxen where I had stopped the previous day but was just too late to taste. I was welcomed back and encouraged to buy Rex Pickett’s sequel to “Sideways” which apparently had a very raunchy scene set there, and was also used as a location for the film. Foxen have two tasting facilities; the original shack which was used as the location where you can taste the Bordeaux and Loire variety wines, and the new facility where the winery is located, just 1km down the road, where you can taste the Burgundian and Rhone varieties. The wines themselves are lovely, showing structure and restraint, but are still somewhat high in alcohol for my taste. A lot of the wines I have tried so far are over 14% alcohol (including whites) but still have relatively good acids, which makes me wonder if they do any acid adjustment to influence the pH. The chardonnay and pinot noirs from Foxen are exceptional, but the highlight was probably the 2003 Foothills Reserve (a Bordeaux blend). The very generous Lee from Foxen invited me up to Laetitia to try their sparkling wines, as they are well-regarded. It’s not hard to see why, as they were formerly under the Champagne Deutz collective, and as such use traditional methods to produce their bubbles. Interestingly they use pinot blanc in their wines instead of pinot meunier, and produce a Brut de Blancs from chardonnay and blanc. Good acids and finesse, the Cuvée M 2006 was showing the best with good yeast characters. Visiting a local Pismo Beach wine bar was interesting, as customers can purchase flights of six wines to try to the final price is determined by the wines tasted. The staff was very knowledgeable and they had a big list, mostly Californian. Lee and I headed down the beach for a sandwich – I had a tri-tip which is basically rump pork with barbecue sauce and nothing else – sorry arteries. Click here to see more photos from Santa Maria, California.